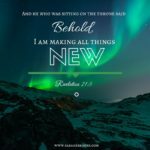 You are here Home » Where is God when tragedy strikes? Something deep within our souls tells us this is wrong. Parents should not have to bury their children. Infants should not struggle for their lives. Mothers should not be taken away from their children. Toddlers should not have to battle cancer. These things cause pain because deep within us we know that this is not the way that things were meant to be. We feel the “lostness” of the situation and it grieves us. Beloved, we live in a broken world, but this is not the way things were meant to be. 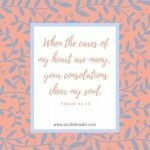 God is not the source of these heartaches – the enemy is. Jesus said that “The thief comes to steal, kill, and destroy; I have come that they may have life, and have it to the full.” (John 10:10). Later, the apostle Peter describes our enemy as a roaring lion “seeking someone to devour.” (1 Peter 5:8). His aim is to cause us to doubt the goodness of God. This is not a new scheme. He’s been at it since the beginning of time. He was able to tempt Adam and Eve by leading them to question whether or not God was really looking out for their best interests. Precious ones, it’s hard to understand why tragedies happen. There is no easy explanation or cliche answer you can give to take away the heartache and pain. We live in a broken world full of sickness, pain, and death. Unfortunately, as a result of the fall, we do know both good and evil. . . and it’s the evil that’s in this world that breaks our hearts. There is comfort in knowing that God is a God of justice, and that one day, each person will give an account before God for their actions. Even those who seem to escape justice in this lifetime will not escape His justice. The enemy has free reign of this world for the time being, but his time is running out. It grieves my heart to see the seemingly senseless suffering in the world around me, but I’m reminded that this broken world is not my home. God has a rescue plan to restore the brokenhearted, to bring beauty from ashes and the oil of gladness to those who mourn, a spirit of praise instead of despair. Where is God when tragedy strikes? I assure you, He is there in their midst, providing comfort and strength to those left behind, redeeming what the enemy intended for destruction. One day things will be as they were always meant to be. Death will be destroyed. There will be no more suffering or pain. Until then, we pray -asking our God of mercy and peace to fill hearts and minds with a sense of his presence, to bring healing to bodies and minds, and for his kingdom to come, on earth as it is in heaven. 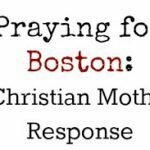 Praying for Boston: A Christian mother’s response. You believe that GOD really cares ? BS, and please do not give me the crap about footprints in the sand. I used to believe all that crap, then life happened. 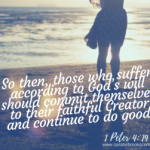 Do I really believe God cares? Yes. Do I believe that we live in a crazy, messed up, twisted world where bad stuff happens? Yes. Are those two realities mutually exclusive? I don't think so. Life is short. I could choose to believe that "Life is hard and then we die," or I can choose to believe that even the negative things can be redeemed. That some good can come out of even the most difficult of situations, and that ultimately the wrongs will be righted. You're just as free to have your own opinion, I won't try to change your mind or debate with you. But if you ask me if I believe what I wrote. Yes I do.